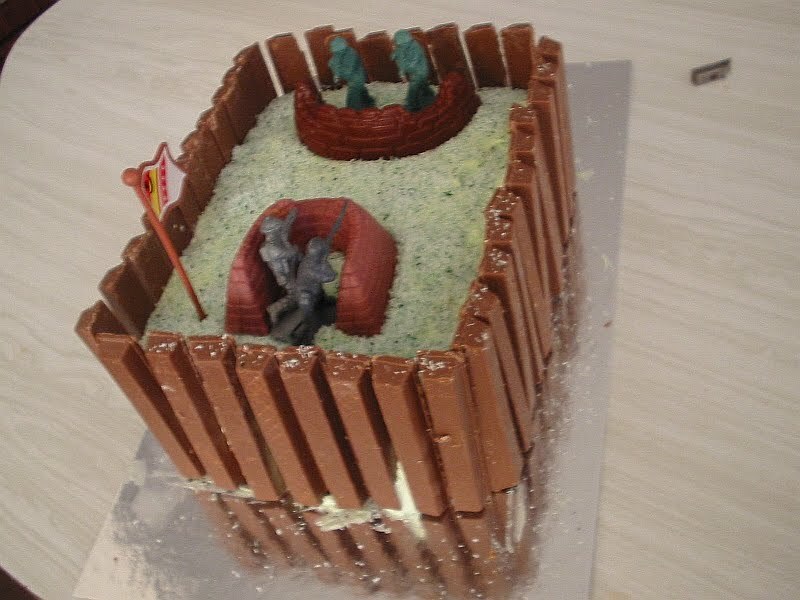 I haven't finished any sewing to show and while searching for photos of past projects not blogged, I came across this cake I made for my army nut son. A lot blogs I am reading at the moment are all posting about birthday celebrations so I though I would share this easy cake idea with you. All that needs doing is purchase a rectangle sponge cake (or two if you want to layer) and also get some kit kats or cheap chocolate fingers. Colour some dessicated coconut green. To do this I just placed coconut into a transparent plastic bag and added a few drops of food colour. Shake bag and also rub until coconut is an even green. Ice cake with frosting, then place kit kats around the outside. Spread green coconut on top and place some army toys in their battle positions. Ta da! This is really cool! I can't show my 19 year old or he will feel he missed out when he was a kid! That is an awesome cake!! Great cake. My daughter happen to walk past as I went to your blog and she remembers having one much the same. :-) Except it was a pool. We both like the Kit Kat idea....yum. A very cool cake, well done! Cool cake. I know what my kids will eat first! Lordy, I've got to start thinking about cakes for a birthday at the end of April. Question is, do I make it myself, or get my sister to make it...??! Or just copy yours maybe! Thanks for your comment on my blog - I'm with you on buying from fellow crafters when I don't get round to making it myself; that's exactly what I do! That sure looks great. Bet it tastes good. Love your blog, my dear. Happy Quilting, my dear friend! That is a cool cake! That's a great cake! Makes me think of my pirate one. I had four little boys..cakes seemed to run towards the militaristic at our house. We also did a fish tank once and a record player. Cake making is so much fun! Good job on that one! Those Kitkats are to die for! Great cake! I love those personalized cakes! I would be all over those chocolates kit kats too! Zoe's b-day party is coming up and we are having a Hello Kitty cake! Can't wait! Aww, that is too cute! My magic carpet win has arrived!